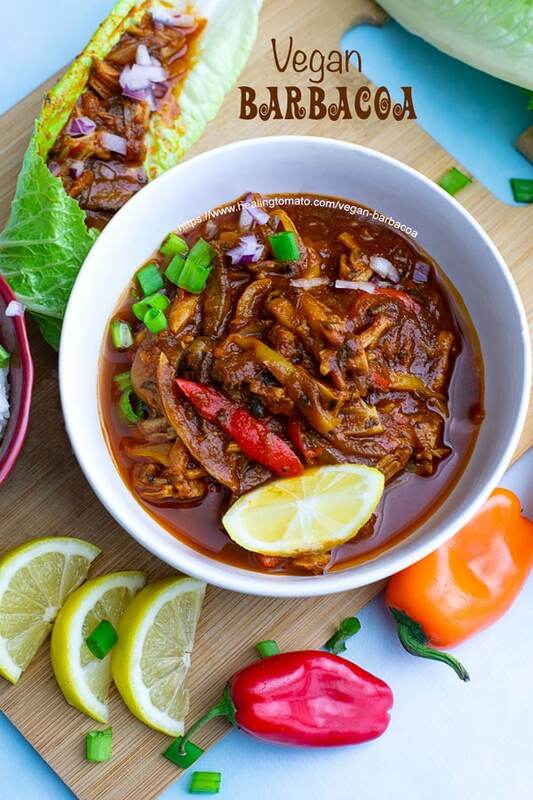 Pressure Cooker Vegan Barbacoa Recipe made with veggies like portobello mushrooms, mini sweet peppers and red onions. 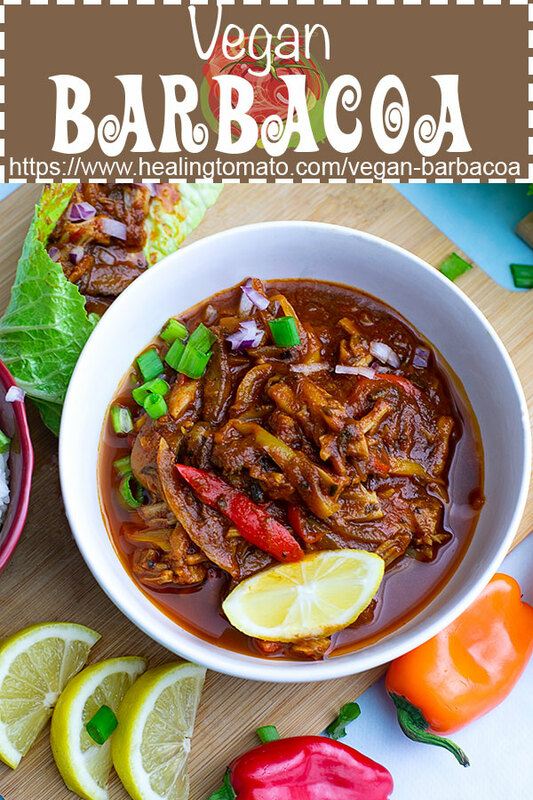 This is a hearty jackfruit barbacoa recipe that can be served with rice, as lettuce cups or in an enchilada recipe. The barbacoa sauce is made using only 3 ingredients. This is my first attempt at making a vegan barbacoa recipe and I have to say that it turned out to be so delicious! I always thought that it would be a very involved process to make a barbacoa recipe, but, I couldn’t have been more wrong. First, the barbacoa sauce is so very easy to make because I only used 3 simple ingredients. The rest of the recipe includes fresh veggies that are available all year round and cook quickly in the pressure cooker. Barbacoa is a cooking method that has its roots in Caribbean cooking. Specifically, it comes from the Tainos Indians who cooked meat using the earth as a cooking pan. They would create a hole in the ground referred to as “barabicu” which loosely translates as “sacred fire pit”. They line the hole with fire-resistant fig leaves which also helped preserve food. There are some instances where the meat was cooked in a hole dug in the ground. The heat was applied from above and using the earth to conduct the heat to the meat. “Barbacoa” evolved to modern day “Barbecue” and we have earth cooking to thank for that. Cooking in earth is a very common way of cooking in the Caribbean and India. In fact, one of my favorite Indian recipes is a an intricate meal that uses an upside down pot over a pit in the ground. Earth cooking is one of my biggest wishes to try someday. Not sure how I am going to go about creating a pit in the ground and start cooking, but, it has been on my bucket list for the longest time. If anyone has legit ideas, please feel free to contact me….. Source: Wikipedia, Aqui Es Texcoco, and some of my personal experiences. This recipe was also a chance for me to use jackfruit again. Its one of those popular vegan ingredients that I haven’t fully embraced. Check out my jackfruit corn chowder recipe where I use it for the first time on my blog. Its was really a hearty soup and gave me an appreciation for its potential. 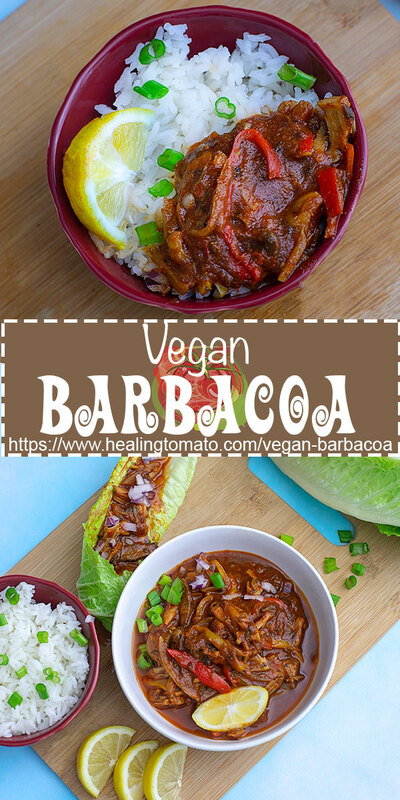 You can add more jackfruit to this vegan barbacoa, if you are have developed a taste for it. I will also not blame you if you want to skip it all together. 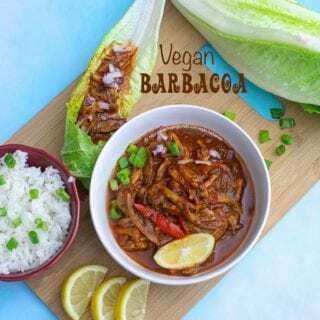 – Make this vegan barbacoa in the instant pot or pressure cooker for those nights when you are going to be too busy. Adjust the cooking time according to the device you are using. My recipe is made using this Bestek pressure cooker and the cook times work perfectly for it. – Use jackfruit from a can because it has been put in a brine solution, making it easier to cook. I used (affiliate link) Arroy-D’s Jackfruit in a brine can. Its very easy to work with and cooks perfectly. 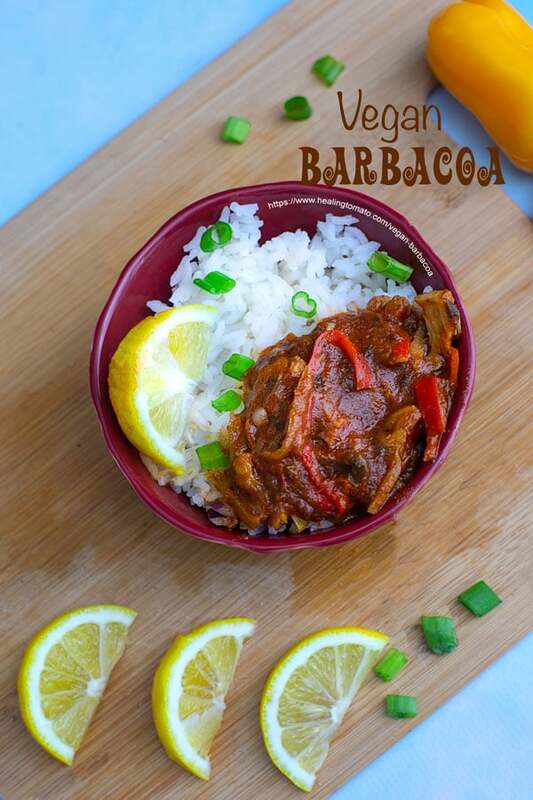 – In the barbacoa sauce recipe, I make liberal use of chipotle in adobo sauce. They are spicy and tangy which may not be for everyone. If you want a chipotle adobo sauce substitute ingredient, I suggest using tomato paste and cayenne pepper (or jalapeno) in its place. Adjust it to your taste and come back to tell me how it worked for you. 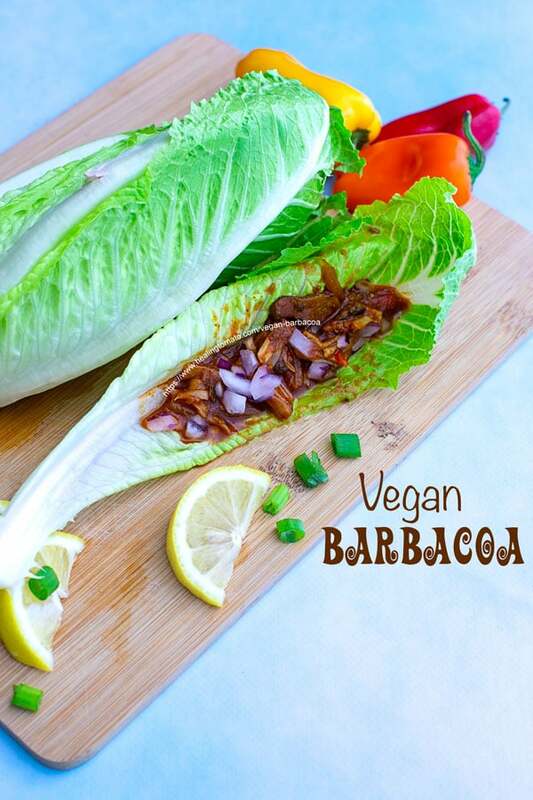 – This vegan barbacoa recipe is more on the saucy side because I loved it over rice. If you want to use it in taco or burrito recipes, use less coconut water in the barbacoa sauce. – My favorite ingredient in this recipe has to be the mini sweet peppers. So, don’t even think of omitting them when you make my recipe! Otherwise, you might wake up with a whole bunch of these chopped mini sweet peppers in your bed. 🙂 P/S: If you have left over mini sweet peppers, stuff them with rice. – Put the barbacoa in (affiliate link) glass meal prep containers and use it up within 2 weeks. I have to admit that this was my favorite way of eating barbacoa. I know I am not supposed to pick favorites because all 3 serving methods are delicious! So, serve it with basmati, any long grain rice or even brown rice recipe. If you are looking for a light lunch idea which is also healthy, you will love eating it in lettuce cups. I served it with romaine lettuce and it was so delicious. The romaine does a great job of evening out some of the spice from the barbacoa’s flavors. This image really doesn’t do the recipe any justice. After taking this photo, I have come to realize that I need to practice taking more casserole dish recipes because I am not very good at it. 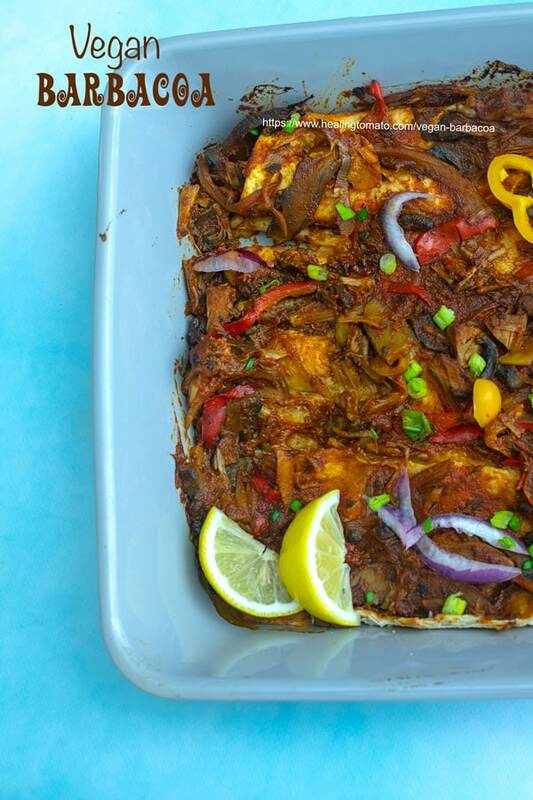 But, ignore my not-so-good image and make these beyond delicious vegan barbacoa enchilada. P/s: I have a very old recipe for vegetarian enchiladas that is quick, easy and hearty. 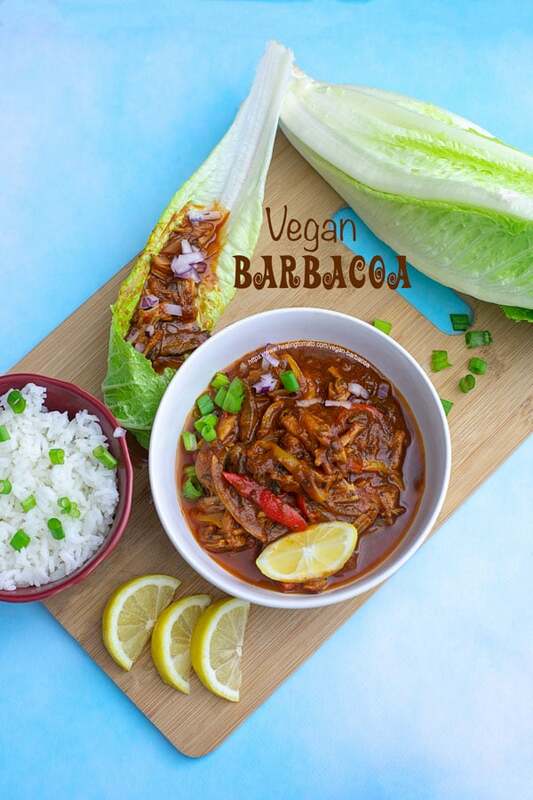 So, how are you going to eat this vegan barbacoa? Close the lid and set pressure gauge to "sealed"
- Depending on the device and brand of pressure cooker you are using, your cook times will vary. Test it with your instant pot / pressure cooker. I used bestek's pressure cooker. I love this for Taco Tuesday but also Meatless Monday! And I am obsessed with jackfruit! Thank You, Jennifer. Its taken me a while to like the taste of jackfruit. Glad to hear that you like it. I can not believe this is VEGAN Barbacoa!!!! I thought for sure it was meat! This looks AMAZING!!!! OMG! I love everything about this recipe. Spice and flavor overload! I was first introduced to jackfruit last year when I had a friend who was vegan over for dinner…. I couldn’t believe how much I as a meat eater really enjoyed it in a spaghetti meat sauce. I am definitely going to hit up your sauce for the barbacoa and try the whole recipe1. I already know Im going to love it! This looks delicious & I just got an Instant Pot, so I can make this. I’ll have to look for jackfruit in a can. I didn’t know they sold it that way. We saw a fresh jackfruit the other day – omg, they are huge!!! Looking forward to this recipe. I love fresh jackfruit, but, its a huge pain to work with. Its hard to cut and it takes forever to cook. I find the canned version to be life savers and time savers.